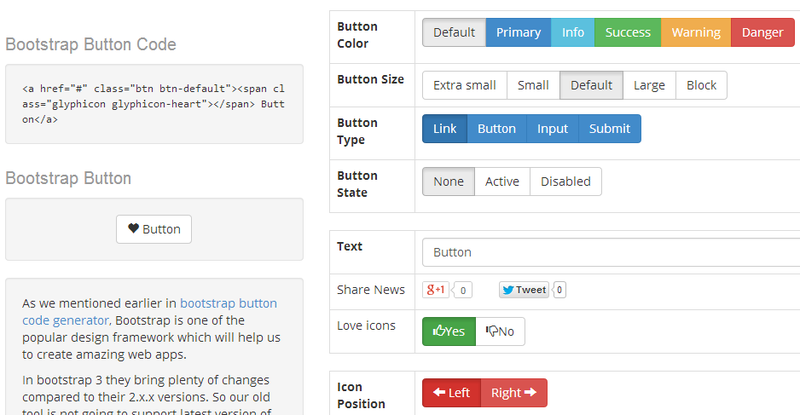 Today I am very pleased to release new version of our bootstrap button code generator. This should help developers for quick development of web applications using latest version of bootstrap (Bootstrap 3.x.x). It supports different color buttons, different sizes, links, button and submit buttons. This tool supports glyphicon icons as well. New bootstrap button code generator supports design and preview buttons for different bootswatch templates as well. It supports bootswatch Amelia, Cerulean, Cosmo, Cyborg, Flatly, Journal, Readable, Simplex, Slate, Spacelab, United and Yeti. Here it is a nice button generated using Flatly and its code. If you find any bug or error please report us about that problem. Thanks for reading, comment your suggestions.